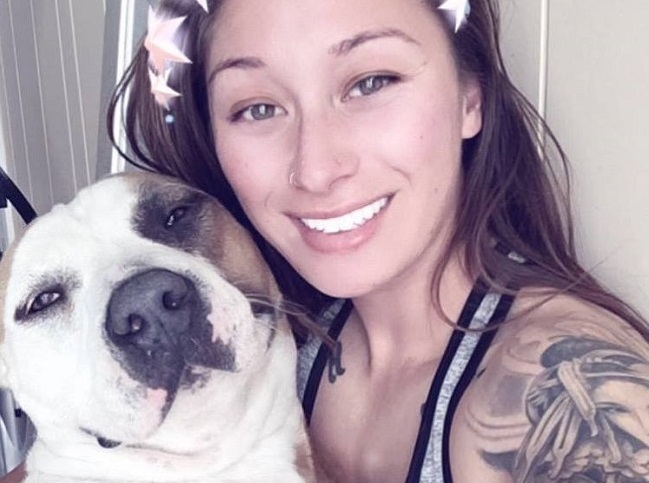 Natasha Wallace wasn’t about to flee from a devastating wildfire in Santa Rosa, Calif., without Bentley, her beloved 4-year-old Pit Bull. Wallace, a student at Santa Rosa Junior College, had been studying across town Monday night. As she drove home around 2 a.m., she could see the flames near her home and knew she’d have to evacuate. She managed to put Bentley in her car and tried to drive away from the fast-moving fire, but got stuck in traffic. So she ran back to her house and grabbed her bicycle and a duffel bag, which became a sidecar for Bentley. Carrying her 70-pound dog, she was able to ride her bike a few miles away from the fire. Fortunately, a good Samaritan named Paul Johnson stopped his pickup truck and gave Wallace and Bentley a lift to a safe evacuation area. Unfortunately, Wallace — who turned 24 yesterday — lost her home and everything she owned, but thanks to her quick actions, she and her beloved Pittie survived. “I don’t even know how to express how grateful I am,” she told FOX40. Here’s how to help pets left homeless by the devastating wildfires in Northern California.